With a long history of providing high-spec instruments to the aviation industry, Breitling is renowned for its professional watches. 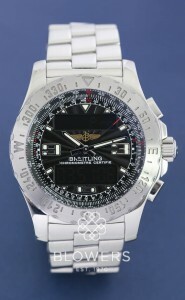 Formerly a manufacturer of cockpit instruments, Breitling Professional watches feature tools such as the slide rule calculator bezel, and emergency distress transmitter. Models in the range include the Aerospace, Airwolf, Co-Pilot, Emergency Mission, and Skyrace. All watches sold by Blowers come with a minimum one-year guarantee. They can be viewed at our Kingston upon Hull shop, or by arrangement at our office in London. Finance options available. 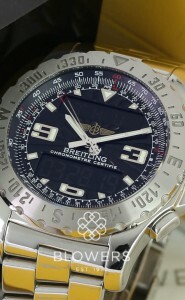 Browse Breitling Professional watches in stock below. Can’t find the model you are looking for? Get in touch and we will endeavour to source it for you.